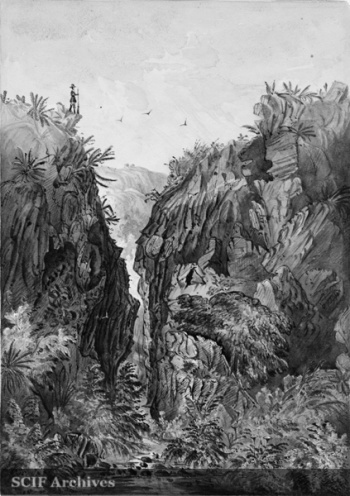 Canyon, South Part San Clemente Island, California, by James Madison Alden, June 1856. ALDEN, James Madison (1834-1921), New England-born landscape artist, nephew of Lieutenant James Alden who came to California in 1854 by invitation of his uncle to accept a position as artist, topographer and junior office aboard the U.S.S. Active for the U.S. Coast Survey. He worked for the survey from 1854 to 1860, creating hundreds of watercolors and drawings of the west coast in exacting detail. In 1855, he created the first known view of Santa Cruz Island entitled Rancho & Valley Santa Cruz Island, California. Alden died in his sleep at age 88, and is buried in Arlington National Cemetery, Virginia. He left a heritage of 670 known works of art. » Stenzel, Franz James Madison Alden Yankee Artist of the Pacific Coast, 1854-1860 (1975). 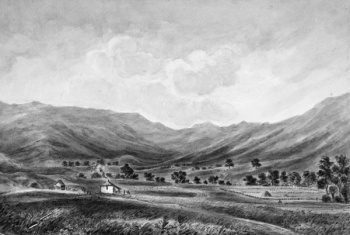 Rancho & Valley Santa Cruz Island, California, a watercolor painted by U.S. Coast Survey artist James Madison Alden in 1855, is the first known view of Santa Cruz Island. It depicts an adobe (Justinian House) at the Main Ranch in the island’s Central Valley, a man on horseback, several fenced fields and a haystack. The view is facing the Portezuela Grade to the west. This page was last edited on 31 January 2018, at 17:31.